This post contains some affiliate links. This means that if you decide to click on any of them and make a purchase, I might receive a small commission that goes back into keeping the blog running. I only recommend and link to products I either use, or really want to use. Thanks for your support! Diet has helped me immensely over the last few years. Three years ago I was hooked on sugar, ate very little in the way of vegetables and was actually really ill with psoriasis, IBS and depression. But it wasn't just diet that helped me recover from my health problems, it was other lifestyle factors too, like getting enough sleep and being active. And one of the most important adjustments I made was to start looking after my thoughts. In other words, calming my mind. I was always anxious - I was one of those kids that worried about everything. One of my earliest memories is me, sitting up in my bed aged about five, crying in the middle of the night to my mother because I had a maths test the next day and I didn't know my times tables. Now I look back, it strikes me that, in the big scheme of things, my maths test when I was five years old was really no big deal. But, as I got older, the anxiety stayed with me - through the essay deadlines and exams of school, college and university. In my first few jobs, I had ever increasing sales targets I had to hit. I worked long (unpaid) hours, trying to reach them, worried that if I didn't I would lose my job. My life was one big thing to just constantly worry about. And then I decided to take control. I took up yoga and went to see a psychotherapist. She told me that mindfulness might be useful for me, and she recommended a book I could read. I bought it, and it worked wonders, helping me to switch off the constantly worrying, analysing part of my mind from my everyday consciousness. Since then, I've tried lots of other ways to calm the mind, trying to do a little bit every day but even more when things get a bit tough or manic in my life. Try some of these ideas the next time you feel like things are getting on top of you. I hope it helps! One of the best things about colouring is that, as described in this article in the Guardian, it can either be mindful (concentrating completely on the shapes you're making, the colours you're using and the pencil or pen strokes) or mindless - allowing you to drift off and kind of meditate while you colour, aimlessy. It helps to calm me, especially if I'm colouring something beautiful that I have an interest in. I love these colouring books - I bought myself an Alice in Wonderland themed book and then I saw one on Shakespeare's plays and I couldn't resist. They're also small so I can just slip them in my bag and take them with me on long train journeys. Once I've finished a few of the pages, I'm going to get them framed and hang them on the wall. Beautiful! Did you know we each have an inbuilt button that can switch off our panicked, stressful response to situations? It's amazing. And you can do it wherever you are. You just take a good, deep breath or two. That's it. Deep breathing is said to stimulate the vagus nerve, which switches off our 'fight or flight' response to a situation. This article has some great information about how deeper breathing can help combat stress. You know that feeling that you're going over your thoughts over and over again? Questioning your actions? Doubting yourself? Trying to come up with a solution to that problem? That's called ruminating, and a study showed that spending time in nature can help break the cycle of those thoughts. And, admit it - who doesn't feel better and calmer after a walk in the woods or along the beach? There are some books that you just can't put down. I've read books while stirring the dinner, a book in one hand and the spoon in the other. A good book will be different for everyone, so find what you like. Like non fiction? Grab a biography of someone you admire, or read a memoir. Love a good story? I know when I was reading The Martian (I read it before the film came out and now I can't watch the film, because I know it will be different from how I directed it in my head!) I couldn't put it down. A good book takes your thoughts away from what you're thinking about - and you might find yourself immersed in another world, even for an hour or so. When you return, you might feel calmer. For me, reading is like a kind of guided meditation, as you immerse yourself in the scenery and the characters of the book you're reading. I downloaded a book by Eckhart Tolle, and it made quite a big difference to my way of thinking. He writes about placing yourself in 'the now'. Forget the future, forget the past, because all that you really have is what's happening now. Feel everything else melt away and become conscious of what's really going on at this precise, exact moment. It's a good tool to have handy if you find yourself feeling anxious. Think about how you speak to yourself, in your mind. If you're anything like me, your internal monologue can be critical, judgemental or just really negative sometimes. This can end up spiralling and leave you feeling worse or raise your anxiety levels while you try to figure it all out. Try and catch the thoughts as they come, letting them go if they're not helpful to you. What would you say to a friend who came to you with this problem? Chances are, you might be harder on yourself than you would be with someone else. Along with colouring, painting, sculpting or any other kind of craft, there's evidence that knitting can really help calm the mind. In a survey carried out by Betsan Corkhill, knitters often said that the craft made them feel 'happier' and many said that the knit purely because it helps them ease stress. Sometimes, when we go over things in our minds, we inflate certain problems we might have. If you're feeling anxious about something, maybe visit a trusted friend. They might help give you a different view or a solution to things. Talking can be a huge step in dealing with a problem. There's evidence that we've enjoyed music for thousands of years. And it does seem to have a calming effect on us, but, as researchers have found, it does tend to depend on the type of music you're listening to. Scientists from the University of California's Psychology Department found that music can help lower your blood pressure - especially classical music. Playing music you love, whatever style it is, is often beneficial and can help us feel better. Meditation doesn't have to mean sitting in weird cross-legged poses with twinkly music on and fairy lights, although be my guest if that's your thing. (I actually love fairy lights.) Just get into the practice of clearing your mind once in a while. I think of my mind like a computer - I have many windows open during the day, the calendar open all the time and a mental list of notes of things I need to do. What would happen if you ran a computer like that, all day, every day? It would need a reboot from time to time. Give your mind a reboot by just sitting very still, unplugging the phone or switching your mobile to silent. Close your eyes and each time a thought crosses your mind, just let it pass - don't judge and don't react. Let it just float past you. Concentrate on your breath going in and out if you need something to focus on. You'll be surprised at how good you can feel after just five minutes. Do some exercise - whether it's Zumba, a run or a spontaneous dance around the house while you do the cleaning - getting up and moving about stimulates the release of endorphins - our body's natural painkillers. They help reduce stress too. And if you can have a laugh while you're doing it and it feels fun, then all the better. I went to see a therapist when I was at my most unhappy. As I sat there, on her sofa, sobbing into a tissue, she walked slowly over to her bookcase and handed me this one: The Mindful Way Through Depression - Freeing Yourself From Chronic Unhappiness. As I read, it was just as if the book had been written for me. It helped me overcome my constant worrying and ploughing over of thoughts. It came with a CD which has guided meditations on it - and the exercises in the book helped me to engage my brain in a more useful way so I was able to switch off the worrying. I totally recommend it. Yep, pets can help you feel calmer. I have a Jack Russell terrier and when she tilts her head and gazes back at me with those alert, brown eyes and her ears perked up I see the world differently. She seems to know when I'm feeling low or worried and jumps up on my lap for a cuddle. And according to Keith Humphreys, a professor of psychiatry and behavioural sciences at Stanford University, stroking a pet can help ease anxiety. If you take a step back and feel really grateful for what you have at this moment, your whole attitude changes. Focus on the things you have rather than the things you don't have. Think about your huge achievements rather than times when you maybe haven't performed your best. Be grateful for every experience, bearing in mind that often we learn something. This simple exercise can switch the train of thoughts in your head from negative to positive, making you feel more at ease with yourself. A goofy Jim Carrey comedy. Vintage cartoons. The Marx Brothers or Laurel and Hardy. Whatever you enjoy, put on a funny film to help lift your spirits. Laughing is one of the most powerful ways to push anxiety away - it's not to forget your problems or rip your 'to do' list up, but more as a way of having some downtime to release some of that tension so you're more relaxed and able to come back to your 'to do' list later, with a clearer mind. Lavender has been used as a relaxation aid for hundreds of years. Its sweet scent helps to soothe and calm our spirits. I bought a diffuser - this one - and I just add a few drops of essential oil to the water in the base, leaving it on for an hour or two to release the vapours. I like Frankincense oil, too. Fretting about the bills while your kids play out on the trampoline? Worrying won't pay them, so get out there and jump along with them. Or play a game of catch. I always find that if I do something childish - playing with hula hoops or a game of football in the garden, I return to my problem afterwards feeling more refreshed and calmer and able to make decisions better. You're also having fun and releasing those important endorphins, too. I used to work at my desk with the news channel on TV all day. I'd take an active interest in the media and the stories they were reporting. But then I noticed something. Most of the stories the media were reporting on were negative. Burglaries, violence and other crimes. Good deeds aren't represented on anywhere near the same scale. I fixated on the crimes and began to see the world as an unsafe place. Some news items would make me feel emotional, which would trigger other worries and concerns. So I switched off the TV and radio. I have a few hours a day where I'm nowhere near the internet. I dedicate half an hour or so to take in the headline news in the morning, and then that's it. I find I'm just calmer because of it. 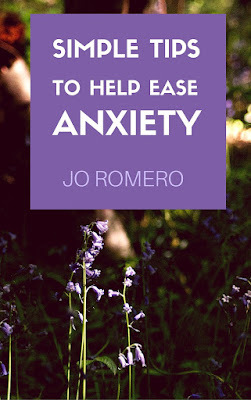 You might find my eBook useful, packed with scientifically-based ways to reduce anxiety. Have a look here. 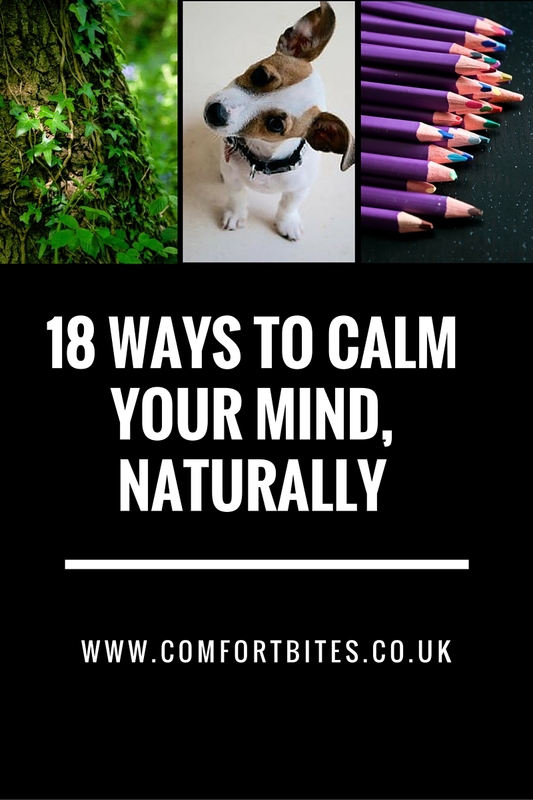 This post is designed to provide help for odd moments where we feel like life's getting the better of us and need to calm ourselves a bit. I'm not a doctor, as I mention on the right in the sidebar. If you're experiencing anxiety or stress that seems as if it's disrupting your life then do get help from a qualified professional. There's lots of help out there. I hope you found this useful. What are your favourite ways to calm yourself and ease your anxieties? Are there any you would add to this list? Let me know in the comments below or on Instagram, Twitter or Facebook.